Follow this link for a summary of models and options. All Southern Star boats can be made custom to your order, but this is especially so with our commercial boats. For more information, please see this page. Southern Star pontoon boats feature molded fiberglass hulls. Our hulls are very durable and saltwater corrosion resistant. They have been tested through years of service in the commercial market. Our unique hull design gives our boats a smooth, quiet, dry ride with superior bow lift. Generally, our boats go faster and perform better than an aluminum tube pontoon with the same power. 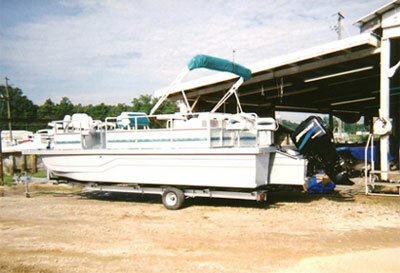 Southern Star pontoons are molded using high quality ISO gel coats, polyester resin, and various glass reinforcements. The typical layup schedule consists of 18-21 mils of gel coat, ½ oz per square foot layer of chopped roving, 1.5 oz. layer of chopped roving, followed by a layer of 18 oz per square yard woven roving. Additionally, key stress areas such as the bottom, corners, and flanges are reinforced with a 1.5 oz. layer of chopped roving and an 18 oz. layer of woven roving. After the hull has been molded, a false bottom is inserted and bulkheads are glassed into place. This internal structure stiffens the sides of the hull and prevents complete flooding in the event of a hull rupture. Finally, the top of the hull is sealed with fiberglass. We have several hull sizes available. Our keel bottom design is available in the standard size to 28 ft, Magnum size to 32 ft, Jumbo size to 48 ft. Our newer style inverted V bottom hull is available to 24 ft in the standard size only. Our pleasure pontoons use the standard size hulls. The magnum and jumbo sizes are generally used for larger commercial vessels. Click here for more information about our hull sizes. Our floor structure uses anodized aluminum hat-channel cross members bolted directly to the flanges on the hulls. This design eliminates the flimsy and fatigue-prone designs used with aluminum pontoons. The hat channels are 1.5� x 2� x 0.10� and are placed on 12� centers on the motor mount section (or rear 8 ft for 3 hulls), and 16� centers for the remaining length. 8 ft and 8 ½ ft cross members are carried in stock, longer lengths are available by special order. The fasteners used are 3/8� SS bolts, SS lock nuts, SS washers. The deck is composed of Greenwood Products XL Plydek, a ¾� 7-ply pressure treated marine plywood. The decking is secured using self-tapping plated floor screws. The deck is trimmed with anodized aluminum deck trim and cast aluminum corner caps. The deck can be covered with marine grade carpet or a fiberglass coating. Our 2 hull pontoons use a separate fiberglass motor mount. This mount has an incorporated spray shield that covers the area between the hulls and 8 ft forward from the rear. It is rated for 200hp. The 3 hull pontoons incorporate the motor mount into the center pontoon rated for 200hp. The configuration can be customized, but the standard is a 20� transom with 20� setback to allow full tilt on most outboards. Motor mounts can be incorporated into the outside hulls as well for dual engine applications. We can increase the rating on our transoms upon request before construction. Our side railings are constructed of 1 1/8� square anodized aluminum tubing. The siding is an embossed color coated aluminum. Siding is available in the following colors (matching hull colors from gel coat chart in parentheses): white (pure white), almond (whalebone), tan (sandy beach), gray (gray cloud). Rail heights are 26� for Starlett and Comet, 28� for Cosmos, Eclipse, and Infinity. Southern Star pontoons are available with optional rigging and outboard power by Mercury Marine.